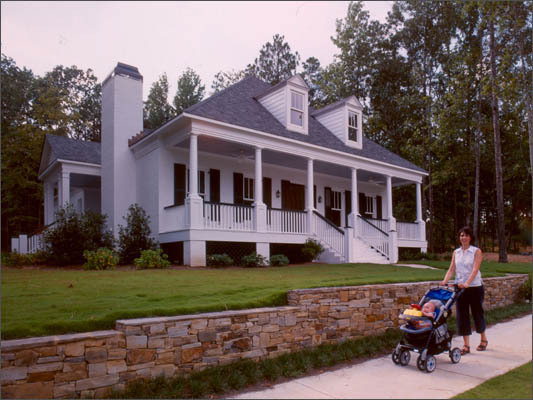 The Preserve is a Traditional Neighborhood Development on approximately 300 acres within the City of Hoover. The goal was to create a healthy, livable community that offers character, convenience and variety and that performs the cultural and civic functions so vital to a real sense of place. Nimrod Long and Associates has designed the overall Master Plan as well as the site entrances, Founders Park, and The Town Village Green, centerpieces of the development. The plant palette chosen features native species that have low maintenance requirements and reinforce the character of the wooded, hilly site. Our approach to master planning embraces a range of retail, office and residential uses within the village center, and establishes a hierarchical structure created by streets and open space. A strong emphasis has been placed on pedestrian oriented environments in order to create a healthy, livable and human scale community. NLA won a 2008 ASLA (American Society of Landscape Architects) Alabama Merit Award in recognition of their Outstanding Professional Achievement for their Landscape Design services for The Preserve.